ECENTLY, I ATTENDED the ordination and first Mass of Thanksgiving of a friend of mine. It was a weekend filled with great joy and zeal and hope. The Church’s liturgy is always powerful, but, for such occasions as these, the wonder of it all often seems more palpable. This was especially true during the homily at the Mass of Thanksgiving, which my friend celebrated and preached. In the middle of this quote, my friend had to stop. It was a very pregnant—about eight months—pause. After nearly a full minute of gathering himself, he continued. This wasn’t a moment of flashy drama or trite histrionics. It was a moment in which he communicated and the entire congregation intuited that this preacher had, in fact, personally experienced the profound love about which he was preaching. It seemed, to me, most appropriate. After all, the love of God is ineffable—literally, unspeakable. 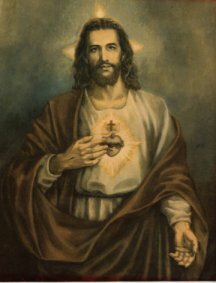 Today, the Church celebrates the Solemnity of the Most Sacred Heart of Jesus, a day on which we specially consider the Lord’s love and tender compassion. I love this feast day. Wouldn’t it be wonderful, though, if every day we could be moved to tears by the enormity of God’s love for us? As the newly ordained priest paused during his homily, I was reminded of St. John Vianney’s insight that “priesthood is the love of the Heart of Jesus.” If that is so, my friend is off to a good start!